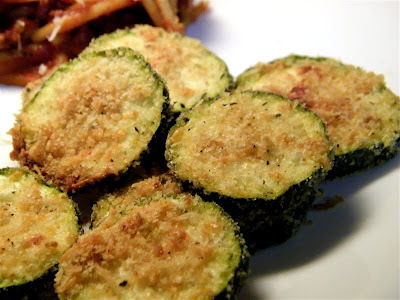 I first saw these Zucchini Parmesan Crisps posted by Pamela of Cookies with Boys. They looked so good, that I had to print the recipe to try. I made these tonight while my one-pot spaghetti was cooking. Sean wouldn't try them (shocker) but Kade did, and D and I decided this is the only way to cook zucchini from now on...they're that good!! Really, you should try them. They are not that hard to fix, and quite tasty. I loved the crispiness that they got. I've tried doing something similar before, and they just got mushy, not crispy, so this recipe is definitely a keeper in my house! Your crisps look perfect! Some of mine got a little dark, but I really enjoyed them. A definite repeater. We love zucchini (especially when it's crispy and has parmesan cheese added to it) - so I'll go check this one out! Yummy! Ok, I haven't had a ton of time on the computer and you get all bloggy on me. Wanna update my blog too? Miss you. COme to my house and teach me how to use this glass top stove!